Create the kitchen of your dreams. As you embark on your next kitchen remodel it’s important to consider kitchen cabinet options. Since cabinets are one of the first things everyone notices in kitchens, deciding on what type you want is no easy feat. Here is a guide that will make the decision process more enjoyable. 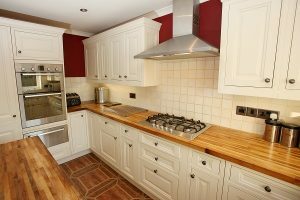 Function plays a key role in choosing kitchen cabinets. However, it’s also important to consider the style of your kitchen. The most popular kitchen cabinet styles are contemporary, traditional, and transitional. Find a style that matches the look and overall feel of that you want from your kitchen. Also, by taking the time to think about what you want out of your kitchen, your cabinets will be able to blend seamlessly with the overall aesthetic of your kitchen. The last thing you want is a kitchen cabinet that sticks out like a sore thumb. These cabinets are your standard cabinets that are often found in a variety of home improvement stores that you don’t need to customize. Typically these are your least expensive options. Stock cabinets are manufactured in limited colors leaving you with only a select few color combinations to choose from. Now, these cabinets are often the ones that are built-to-order by the manufacturer. This assures that they are measured properly and will fit perfectly within a kitchen that may not be able to accommodate standard size cabinets. Cabinets that give you an opportunity to design the custom kitchen of your dreams. These are best for kitchens that are unusually shaped or for the homeowner who wants a unique look of their own. Choosing your cabinets can seem like an overwhelming process that can be made easier by understanding what exactly you want and need from your kitchen cabinets. Whether you’re looking for a remodel or an update, talk to one of our experts at Elite Kitchens about building your dream timeless bathroom. With our excellent designers, installation process, and quality craftsmen, it’ll be the best investment you’ve made in your home. Contact us online, by calling 301-881-2776, or email us for a free estimate and assessment of your needs. All of our work is backed by a 100% satisfaction guarantee. We look forward to meeting your remodeling needs for years to come! To see examples of our work and get more tips, follow us on Facebook, Twitter, Google+, LinkedIn, Houzz, and Pinterest. This entry was posted on Thursday, February 2nd, 2017	at 9:56 am	. You can follow any responses to this entry through the RSS 2.0	feed. Both comments and pings are currently closed.